Description: Relative to the industry, the number of referrals received from clients by advisors at Mosaic was low. Particular attention was needed to boost referral opportunities from existing clients and other sources. 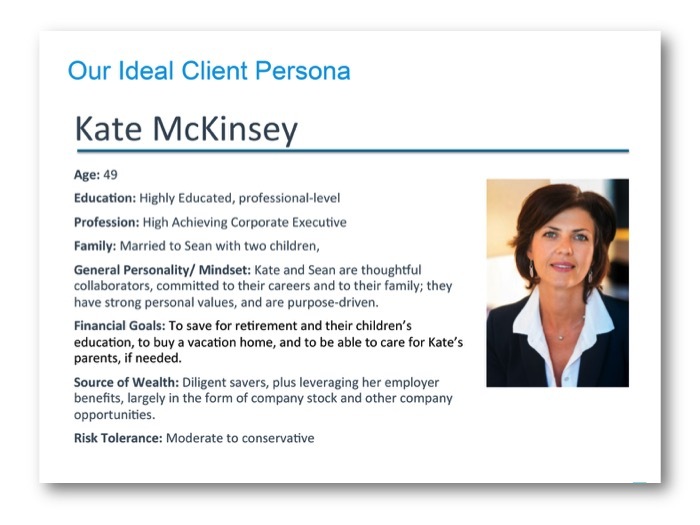 Working with the Charles Schwab Business Development Center, I led a cross-discipline team to create common and consistent messaging about whom we served best and what people valued most about our firm. We wanted everyone in the firm to feel confident in their ability to explain what the firm does, and to feel that he or she had the potential to directly impact the growth of our firm. Deliverables: Referral Culture Vision Statement, Ideal Client Persona, Unique Selling Proposition, Singular Concept, Story Library, training for staff to recognize who fits the ideal client profile as well as the trigger moments when meeting with an advisor is particularly needed.